Granola is one of those foods that is so versatile and loved by many. It can be a breakfast, a snack, an ingredient in a recipe and anything in between! Ola Granola offers non-GMO, gluten-free and super delicious granola in great flavors such as Vanilla Almond, Cranberry Orange Pecan, No Nut Vanilla and Chocolate Banana Chip. In addition to the larger, resealable bags, Ola Granola also comes in easy to use, single serve pouches with 100 calories per pack! As more and more people become unable to digest gluten it is so great that they have now a gluten free option for granola as well! 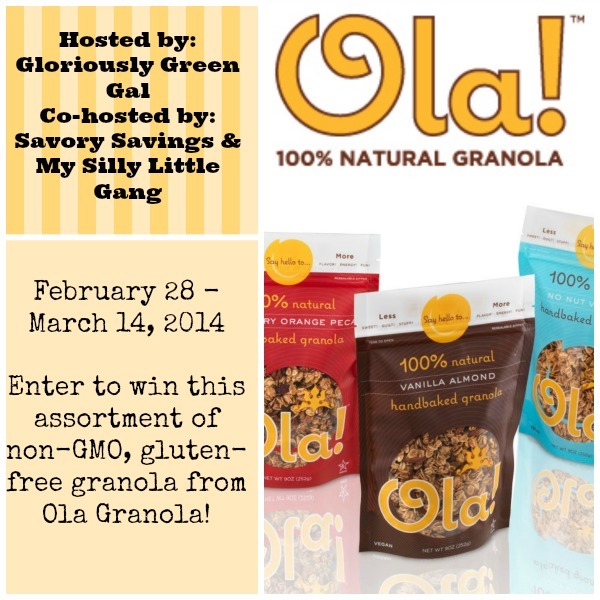 If you would like to win an assortment of Ola Granola products, enter with the giveaway tool below. This giveaway is open to US residents, ages 18 and older. It will run from February 28, 2014 through March 14, 2014 at 11 PM CST. If you have won an Ola Granola giveaway on any blog in the last six months, you are not eligible to win. All entries will be verified. Winner will be emailed (consider adding gloriouslygreengal@gmail.com to your safe list) and will have 48 hours to respond or prize is forfeited and a new winner will be selected. Next post: Blogger Opp! All About Blanks! I learned that they have a few flavor, chocolate banana chip that I would love to try!